This product was sent to me for review by the kind people at House of Doolittle and Shoplet.com. 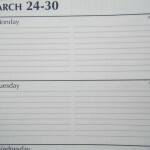 I don’t really use these types of calendars (and didn’t know this was being sent to me), so I am going to refer to you to my review on the House of Doolittle Weekly/Monthly Planner and my more recent review on the House of Doolittle Weekly Business Planner for comments on the quality of product and paper. 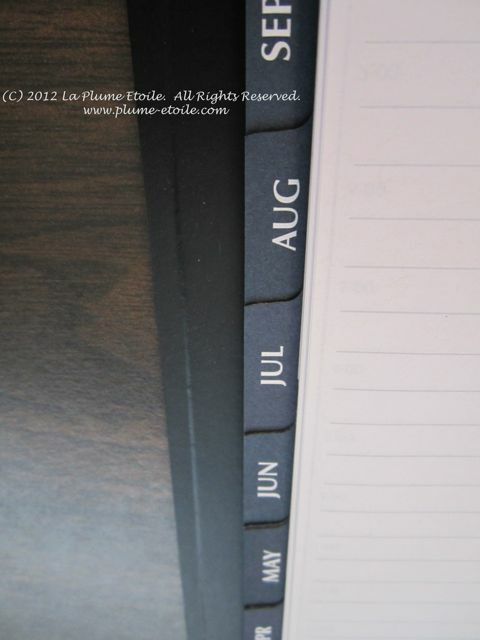 It is my guess that this desk pad calendar lives up to the same quality as the planner. For someone that does use this type of desk pad calendar, I think it would be a great choice! You can purchase this product for $6.90 + shipping from Shoplet.com by clicking here. I did a review of a very similar House of Doolittle planner here. This planner is almost the same, but with a few variations. 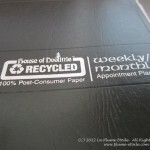 Cover: The cover is made from “embossed simulated leather” composed of 50% recycled material. To be honest, it feels more like a flexible plastic, and one can see texture added. The cover color of mine is black, although I do not know if it comes in other colors. Size: It’s quite large for a planner, 8.5 x 11″ to be exact. While I normally don’t use planners this large, it’s size actually has a more executive attitude. 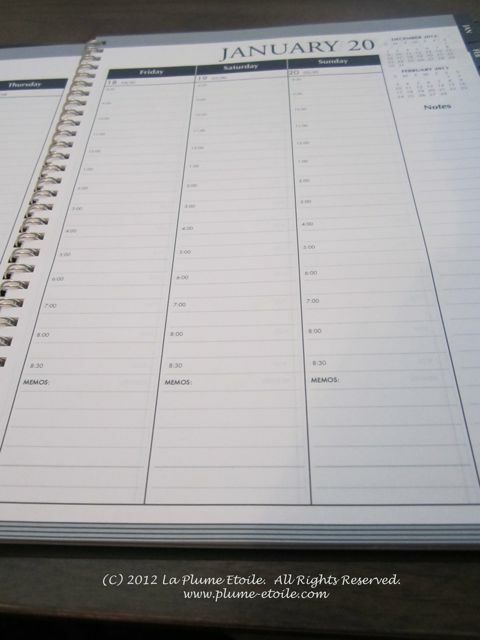 Layout: This is a weekly format and each week has a section to keep track of your business expenses. I’m sure this format works for many people, but I personally prefer a little more space to write in each hour slot. I just picked a random week to photograph so you can see the format. Paper: The paper is made from 100% Post-Consumer Paper and printed with soy ink. Let’s be clear, this is not Clairefontaine paper. For recycled paper, it is fairly smooth. It is a nice bright white, and printed with blue text and grey lines. The paper is on the thinner side, but sturdy. There is definite show-through, both from the page printing and from fountain pen ink. I have not experienced bleed-through, although Private Reserve’s DC Supershow Blue did have more significant show-through. Most fountain pen inks do feather slightly on this paper, but it’s not glaringly obvious – you have to look more closely to really see the feathering (although more saturated inks like DCSSB do have slightly more pronounced feathering). Improvements: Tear-off tabs like the Exaclair-distributed planners would be helpful to easily find the current week within the current month. I would also like it if there was no feathering and less show-through. 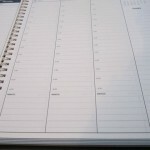 The planner is also non-refillable, which may be a bother to some people. Other notes: I really like that this planner is made from 100% recycled products, 100% post-consumer paper, 100% made in the USA, 50% recycled cover material, 90% recycled wire, and printed with soy ink. 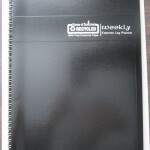 I am actually surprised at the high quality of this planner due to it’s mostly recycled content. It makes me feel more responsible to be using something environmentally friendly, and I like that the company is supporting the US economy by making products at home. Another cool thing is that the company has been making dated products since 1919 and all of their products are made from recycled materials. 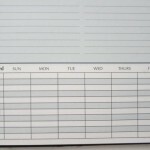 Purchase: If you would like to purchase this planner from Shoplet.com for $13.22 + shipping, click here for the product page. 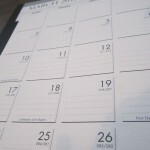 I don’t really use these types of calendars (and didn’t know this was being sent to me), so I am going to refer to you to my review on the House of Doolittle Weekly/Monthly Planner for comments on the quality of product and paper. 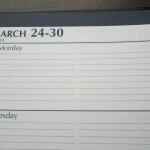 It is my guess that this desk pad calendar lives up to the same quality as the planner. For someone that does use this type of desk pad calendar, I think it would be a great choice! You can purchase this product (for $5.91 + shipping!) from Shoplet.com by clicking here. 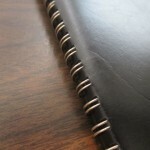 I am trying a different kind of planner this time – a wirebound, weekly, large-sized planner made from recycled materials. 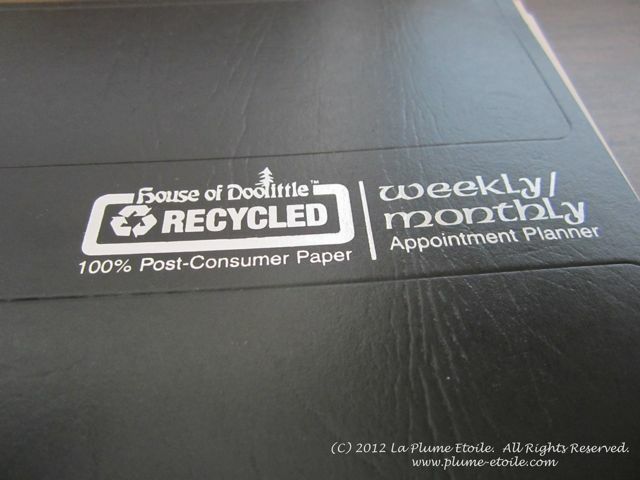 Specifically, the 2013 Weekly/Monthly Appointment Planner by House of Doolittle. This product was sent to me for review by the kind people at House of Doolittle and Shoplet.com. Size: It’s quite large for a planner, 8.5 x 11″ to be exact. 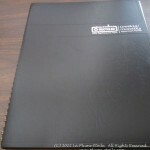 While I normally don’t use planners this large, it’s size actually has a more executive attitude. I feel like I have more space to write and see my week all at once. 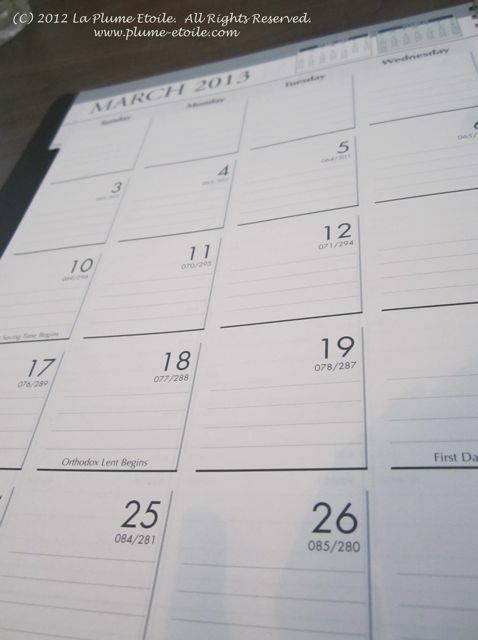 Layout: Each month begins with a month-view calendar, similar to the box format you would find in a wall calendar. There is a column for notes on the right side. I used these monthly pages to write birthdays and other important dates so that I can check them at the beginning of each month, as well as transfer the information to the appropriate weekly page. 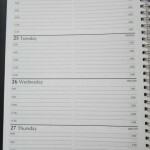 The rest of the pages are a weekly layout with one full column for each day of the week. Some smaller planners have shorter spaces for the weekend, but I like that Saturday and Sunday get equal spacing and scheduling time. The week starts on Monday, and each day has and 8:00 AM – 8:30 PM schedule. Each hour has two lines, so you can write in something at the half-hour mark if needed. There is also a “Memos” section at the bottom of each column, and a column for notes off to the side. 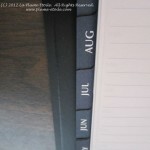 Each page is tabbed by month so you can easily flip to the desired month, however, you may need a clip or bookmark for the pages within the current month. There are a few blank lined pages at the back, and an owner information page at the front. Improvements: It would be nice if the daily schedule starting earlier than 8 AM and ending later than 8:30 PM, although the memo section could be used to compensate for the later hours. Also, tear-off tabs like the Exaclair-distributed planners would be helpful to easily find the current week within the current month. I would also like it if there was no feathering and less show-through. 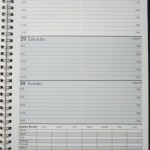 The planner is also non-refillable, which may be a bother to some people. 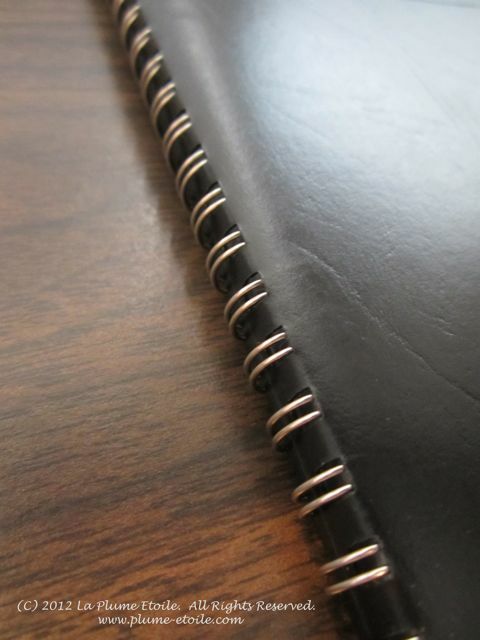 Other notes: I really like that this planner is made from 100% recycled products, 100% post-consumer paper, 100% made in the USA, 50% recycled cover material, 90% recycled wire, and printed with soy ink. 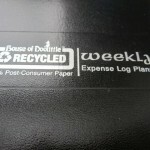 I am actually surprised at the high quality of this planner due to it’s mostly recycled content. It makes me feel more responsible to be using something environmentally friendly, and I like that the company is supporting the US economy by making products at home. Another cool thing is that the company has been making dated products since 1919 and all of their products are made from recycled materials. I also really like that the large format and layout lets me see my whole week and each day in it at once, with enough writing room to see actually what I am doing throughout the day. Overall: I haven’t gotten to use this planner extensively yet because the dates don’t begin until January 1, 2013. However, I am looking forward to using this and seeing how it goes throughout the year. 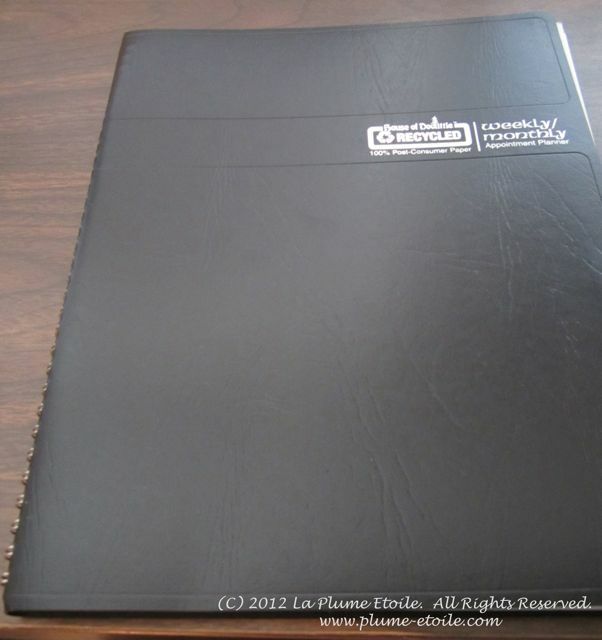 Purchase: If you would like to purchase this planner from Shoplet.com for $14.15 + shipping, click here for the product page.